To understand why The Crew is probably going to be a bit brilliant, you need to know where it’s come from. First, Ubisoft hooked the Test Drive team up to a money-drip capable of feeding their sandbox ambition without compromise. Then, they chucked in the Driver team from Newcastle – men and women who understand the art of careening and collision. The result looks like a standout of the “action-driving” genre, as Ubisoft have coined it – a fantasy US open world where metal meets metal as often as pedals do. Take a look. There are elements of the distraction-driven open worlds of Assasin’s Creed and Watch Dogs here. The landscape is littered with landmarks, which increase your ability to level up when discovered, and secret car wrecks, whose salvaged parts can be used to build exotic rides. Ubisoft also take us through The Crew’s broad mission types: Go To is a simple, hectic A to B of the kind we used to set ourselves in GTA – while Collect sees players ‘pick up’ (read: smash through) items scattered along routes throughout The Crew’s shrunken US. Get Away is a hash at classic Driver, putting you at the wrong end of a police chase. Follow and Takedown both stick you at the right end, tailing a villain – and in the latter mode using your car as a “weapon” to take them down. Outrun is simple checkpoint-chasing, and Race is proper, conventional motorsports. But developers Ivory Tower and Reflections seem most proud of their Skill Challenges: environment-specific tasks that let you hone your abilities on jumps, slaloms and the like – and be rewarded with XP and parts for your vehicles. Whether any of this works is conditional on things like handling and drifting – what it feels like to play the The Crew moment-to-moment. But you can’t fault Ubisoft on variety, can you? 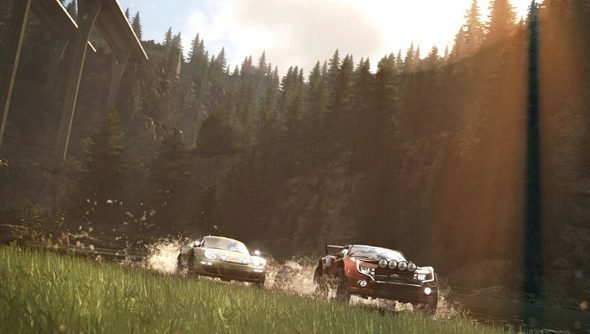 The Crew will be out on November 11 in the US, and November 14 in Europe. Until then, you can busy yourself working your way through the best racing games on PC.